The Avatar SB123 comes standard with an AMERICAN made Eminence Delta LF 12 inch bass speaker, an Eminence 6″ sealed back mid and a Foster Horn Tweeter. The Eminence Delta 12 LF has a large 56 oz magnet for greater efficiency. 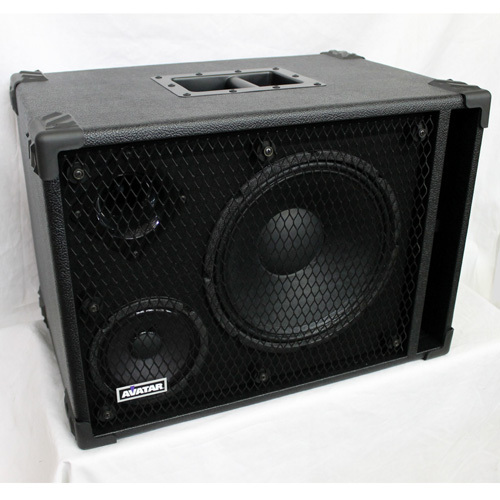 Also available is a custom designed Eminence Deltalite2 NEO 12 with an extended cone travel (Xmax) for improved low end. This SB123 has tons of deep lows perfect for 5 or 6 string bass guitars. The Eminence crossover is a full 12db per octave dividing network using mainly Mylar capacitors. Guys that know crossover design know that Mylar capacitors respond much faster and more accurately than regular Electrolytic caps found in many cabs. Mylar caps typically have much closer tolerances such as 5 percent instead of typical 20 percent in Electrolytic caps. Mylar caps cost way more but its worth it with regards to consistency and tone. The crossover takes the 12 up to 800Hz, where the mid comes in and goes up to 5KHz to meet the tweeter. Both the mid and tweeter are padded down to evenly match the efficiency of the 12. The result is a very linear, balanced rich smooth sounding 12 inch 3-way. The cabinet is made from superior 3/4 inch 13 PLY voidless Birch Plywood with box finger joints joints for extreme strength. The cabinet comes standard covered in black tolex, has protective corners, large recessed steel bar handles, full face steel diamond pattern expanded metal grill, front slot port, steel input panel with dual Speakon connectors and dual 1/4 inch in/out jacks. All four jacks on the back panel are wired together in parallel so you can go in or out of any of them for maximum flexibility when connecting this cab to amps or to other speaker cabs. Dimensions 17 3/4″H X 24.5″W X 16.5″D. Weight with Delta 12 LF 52 lbs, Neo Weight approx 46 lbs. Limited one year warranty.